Narrowing down a list of just the 10 best museums in Oklahoma is no easy feat. Oklahoma is home to a variety of different places to explore the heritage of its people and life in the American West. Oklahoma was the 46th state to enter the Union. Approximately 374 miles of the historic U.S. Route 66 runs through it. The state has an immensely rich Native American history, and that’s just the beginning of it. The culture of the state and its historic events are commemorated across a variety of museums. Here are the 10 best in Oklahoma to explore. Although Science Museum Oklahoma was designed to be kid-friendly, adults will enjoy the hands-on science activities, the planetarium and the model train exhibit. Younger children will want to play in Kidspace, a safe place with bubbles, puppets and slides. Don’t miss the second floor, which features beautiful artwork and a gymnastics play space. The Gilcrease Museum has more than 350,000 pieces of art and artifacts in its collection. It’s billed as the most comprehensive collection of items related to the American West, with a special emphasis on Native American materials. Only about six percent of the collection is on view at any given time. The grounds of the museum include 23 acres of historically-themed gardens. Visit free on the first Tuesday and Third Sunday of every month. You don’t have to be a gun or military enthusiast to appreciate this collection of more than 14,000 guns. In addition to the numerous firearms, the museum houses a unique stein collection from Germany, Will Rogers memorabilia and other choice weapons, such as canes, knives and swords from all over the world. One aisle is dedicated to the hangings of infamous criminals, and another aisle is devoted to horses and ranchers, displaying items used on the cattle drives. Come on the first Saturday of the month to see a high noon cowboy shootout. Step into another world from the moment you enter this museum. As you pay your ticket, you’ll see the iconic statue by James Earle, the End of the Trail, a Native American and his horse. Weave through the many galleries, featuring artwork by Frederic Remington and other western artists who captured the spirit of the American West. Don’t miss the John Wayne room or the display of barbed wire. A kid-friendly museum with more than 50,000 square feet of exhibit space featuring life sciences, earth sciences and social sciences. Learn how the food chain works. Dig up dinosaur bones. Understand world cultures and enjoy the hall of natural wonders where you can walk-through a limestone cave and experience bats, crayfish and other animals that live in total darkness. The Dale Chihuly glass exhibit may be the most spectacular display in the entire museum, but the OKCMOA houses a number of stunning pieces of modern art and photography. Featuring such prominent artists as Georgia O’Keeffe, Pierre-Auguste Renoir and Anne Truitt, you could spend the entire day studying the masters. Stop by the museum café for an innovative meal that focuses on fusion cuisine. Featuring the Phillips family mausoleum, this museum north of Tulsa also has a petting zoo, an extensive collection that documents the history of the Oklahoma oil industry and a huge Native American center. Explore the 3,700-acre wildlife preserve to observe elk, bison and longhorn cattle, which are native to Oklahoma. 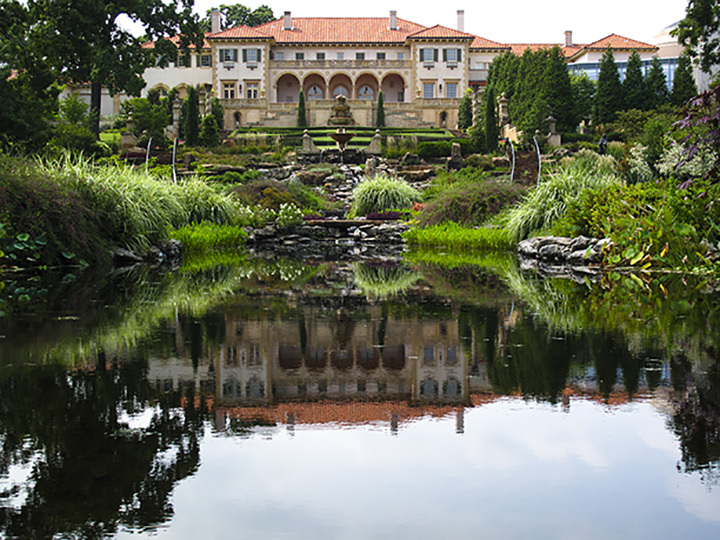 One of the top 50 museums in the United States, not only does the Philbrook contain an extensive art collection of modern and contemporary art, it also houses a unique Native American collection of artifacts and artwork. Explore Asian, African and European art before taking a walking tour of the beautiful gardens. Visitors enjoy strolling through the sensory garden, featuring sculptures, bridges and meditative niches. The gardens are handicap-accessible and open all year long, but the best time to go is in the late spring when many flowers are in bloom. Give your child new ideas about career goals when you bring your family to this hands-on museum in Seminole. You’ll have the opportunity to explore science and math ideas, discover new ideas about healthcare and enjoy a 12,000 square foot castle maze. Children must be accompanied by a parent, but you’ll learn to play again when you come out and join in the fun. Located in western Oklahoma, this interactive aviation gallery teaches visitors about the history of flight. It’s a Smithsonian Affiliate and displays over 3,500 artifacts, including actual aircraft and replicas. One of its newest acquisitions is the NASA’s primary Shuttle Fixed-Based Simulator (FBS). See the Gemini Space Suit and Gen. Stafford’s FLOWN Apollo X Space suit up close.